• BOYS 16 – Nicholas Montoya of Scottsdale topped Jay Rogers of Sierra Vista in the singles finals, 3-6, 7-5, 6-3. Alex Lawson of Tempe dropped Jacob Hedderig of Cave Creek in the third place match, 6-0, 7-6(5). 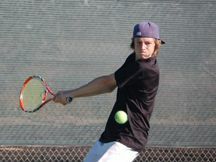 Andrew Mayer of Scottsdale won the consolation final, and Dominic Patrick of Gilbert won the quarter consolation final. James Carr of Tempe, partnered with Rogers, to win the doubles final over Lawson and Montoya. •	BOYS 14 – Augustus Ge of Phoenix fought through singles draw before falling to Robert Seby of Oro Valley in the finals, 6-4, 6-2. Alec Singh of Phoenix defeated James Ponwith of Scottsdale in the consolation final, 6-1, 6-2. Joshua Hedderig of Cave Creek, partnered with Jared Aldor of Vail, won the doubles final over Ge and Gregory Anderson of Tucson, 8-5. • BOYS 12 – Nathan Ponwith of Scottsdale beat Wilson Lambeth of El Paso in the singles final, 7-6(0), 6-4. Andy Yuwen of Chandler placed fourth. Ponwith also won the doubles final, partnered with Yash Parikh of Tucson, over Nathan Niemiec of Litchfield Park and Gavin Lynch of Albuquerque, 8-1. • BOYS 10 – Roman Shenkiryk of Phoenix won the singles final over Brandon Stringfellow of Scottsdale, 6-0, 6-1. Max Woodhead of Litchfield Park placed third. Shenkiryk also won the doubles final, partner with Yusuf Saleem of Phoenix in a round robin. • GIRLS 18 – Stephanie Vlad of Scottsdale won the singles title, defeating Haley Driver of Scottsdale, 4-6, 7-5, 6-0. Kelsey Lawson of Tempe took third over Mele Iongi of Mesa, 6-0, 6-2. Emily Harris of Scottsdale grabbed the consolation title, dropping Dara McDevitt of Albuquerque, 6-1, 6-0. Cassie Hochwalt of Scottsdale won the quarterfinal consolation final. Vlad, partnered with Hailey Rochin of Tucson, defeated Iongi and Lawson in the doubles final, 8-5. • GIRLS 16 – Erica Medlin of Mesa placed fourth, losing to Courtney Amos of Tucson in the third place singles match, 6-3, 6-0. Kelley Cahill of Scottsdale won the consolation final over Kathryn Hunnicutt of Phoenix, 7-6(3), 6-3. Jordan Bridges of Mesa placed second in doubles, partnered with Katrina Domingo of Oro Valley. • GIRLS 14 – Madison Clark of Phoenix won the singles final over Sara Brown of Tucson, 7-5, 6-3, while Alexandra Letzt of Scottsdale defeated Sara Parker of Gilbert, 6-1, 6-0, for third. Kristi Lee of Scottsdale beat Scarlet Rush of Phoenix in the consolation final, 4-6, 6-4, 6-0. Emily Serrano of Scottsdale won the quarter consolation final. Stephanie Hu of Gilbert and Kendra Mahoney of Litchfield Park won the doubles final over Clark and Maggie Cohen of Phoenix, 8-4. •	GIRLS 12 – Emily Grossnickle of Scottsdale won third place over Delaney Nothaft of Tempe, 6-4, 6-1. Sydney Roman of Gilbert defeated Bianca Olivas of Avondale in the consolation final, 6-1, 7-5. Kylie McKenzie of Anthem won the quarter consolation final. Nothaft and Melissa Kahn of Phoenix lost in the doubles finals to Caroline Amos of Tucson and Melissa Pick of Albuquerque, 8-5. • GIRLS 10 – Whitney Goett of Paradise Valley won the singles title over Ksoosha Ramras of Paradise Valley, 6-0, 6-3. Josie Frazier of Laveen beat Zoey Nelson of Waddell for third place, 4-6, 6-0, 6-1. Gabriella Lawlor of Goodyear won the consolation final, 6-2, 7-6(7), over Alexandra Ochotorena of Albuquerque. Zoey Bargas of Phoenix won the quarter consolation final. Victoria Franco of Tempe and Goett partnered to win the doubles final over Nelson and Frazier, 9-7.